This book explores the ways in which theologians at the early University of Paris promoted the development of this new centre of education into a prominent institution within late medieval society. Drawing upon a range of evidence, including many theological texts available only in manuscripts, Spencer E. Young uncovers a vibrant intellectual community engaged in debates on such issues as the viability of Aristotle’s natural philosophy for Christian theology, the implications of the popular framework of the seven deadly sins for spiritual and academic life, the social and religious obligations of educated masters, and poor relief. 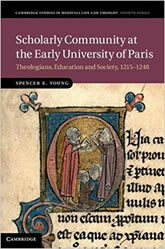 Integrating the intellectual and institutional histories of the Faculty of Theology, Young demonstrates the historical significance of these discussions for both the university and the thirteenth-century church. He also reveals the critical role played by many of the early university’s lesser-known members in one of the most transformative periods in the history of higher education.